The Celtic harp, and the pure and beautiful vocals of Ruth Sutherland, the mixture of four different styles of bagpipes played as only expert bagpiper Bob Worrall can, and the robust vocals, and myriad of other instruments (including drums, guitar, harmonica, djembe, banjo and sitar) played to perfection by Doug Feaver, all add to create this varied and magical music. A remarkable and wonderful fusion of Celtic and roots, traditional and original, old and new, a hundred years of musical experience, played now, with joy, with respect, from the heart…acoustic and real…. 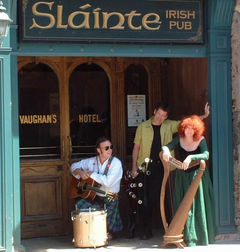 Scantily Plaid has been playing festivals, highland games, Celtic festivals, concerts and clubs for 9 years. Their travels have taken them across Canada, the US, and to Scotland, France, and Uruguay. Scantily Plaid is receiving critical and rave reviews. Individually and collectively they are festival veterans. Their first recording, “just checking in….” is now widely regarded as a classic, and the recording of their eagerly-anticipated second CD is now underway.